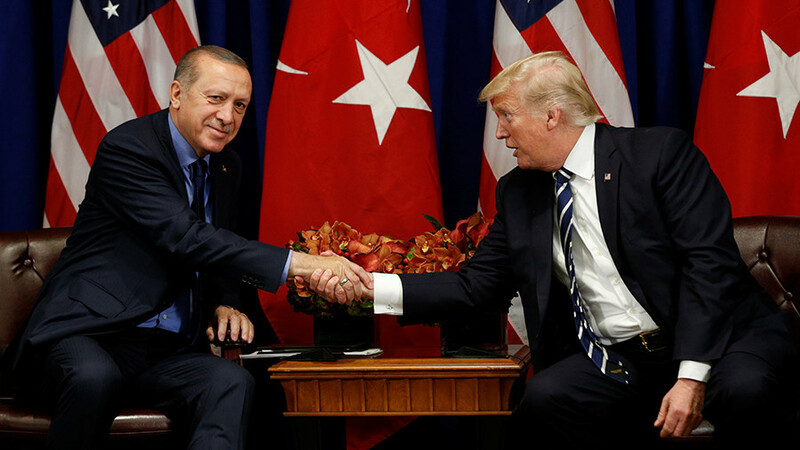 The US and Turkey have discussed “pending adjustments” to military support for Washington’s “partners” on the ground in Syria, and have agreed to join forces against “all forms” of terrorism, including the Kurdish PKK and Fetullah Gulen’s movement. Washington and Ankara reaffirmed commitments to jointly fight not only Islamic State (IS, formerly ISIS/ISIL), but “all terrorists organizations,” including the Kurdish PKK and Fetullah Gulen’s movement, the Turkish presidency said following Recep Erdogan’s phone conversation with Donald Trump Friday. The two leaders also "discussed recent developments in Syria, bilateral ties and a summit in Russia's Sochi,” where President Vladimir Putin hosted Erdogan and Iranian President Hassan Rouhani earlier this week, the statement added. Earlier, Turkey's foreign minister announced that Washington has also allegedly agreed to stop arming the People’s Protection Units (YPG), a Kurdish militia that serves as the backbone for the US-led Syrian Democratic Forces. “President Trump also informed President Erdogan of pending adjustments to the military support provided to our partners on the ground in Syria, now that the battle of Raqqa is complete and we are progressing into a stabilization phase to ensure that ISIS cannot return. The leaders also discussed the purchase of military equipment from the United States,” the White House said. Turkey has long argued that the US must stop funding and arming the Kurdish Units in Syria, emphasizing that YPG is a terrorist organization affiliated with its own homegrown Kurdish insurgent group, the Kurdistan Workers’ party (PKK). Trump's conversation with his Turkish counterpart comes two days after Russian President Vladimir Putin hosted the leaders of Iran and Turkey, trying to find a political solution to end the crisis in Syria, as the battle against terrorist groups enters its final stretch. Ankara and Tehran played crucial roles in negotiating the so-called “de-escalation zones” in Syria, and are actively involved in trying to attain a political settlement in the war-ravaged country. “The presidents of Iran and Turkey supported the initiative to convene an all-Syrian forum-congress of the national dialogue in Syria. 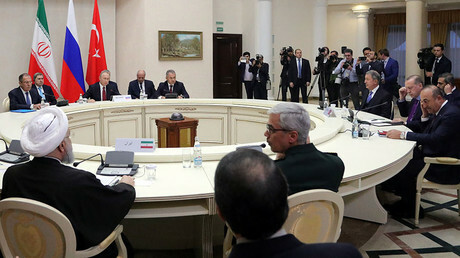 We agreed to hold this important event at the proper level and ensure the participation of representatives of different sectors of Syrian society,” Putin said after the talks in Sochi Wednesday. Ahead of his engagement with Presidents Erdogan and Rouhani, Putin met with the Syrian President Bashar Assad Monday, as the Kremlin amplified its leading role in trying to negotiate a peace settlement in Syria. The future of Syria also dominated an hour-long phone call between the Russian and American presidents Tuesday. In 2015, Russia sent its warplanes to help Damascus fight against terrorists and extremist Islamist forces trying to overthrow the Assad government. The operation prevented a collapse of the secular Syrian state, and paved the way for a political dialogue with opposition groups who see a future for Syria free from extremist ideology.